Raptor Resource Project Blog: Is the last egg going to hatch? Is the last egg going to hatch? As of this morning, the unhatched egg in Decorah is somewhere between 49 and 42 days old. Can it still hatch? Eagle eggs have hatched as late as 44 days after they were laid. If this is the last egg, we still have roughly two days in which hatch could occur. However, eggs have never hatched this far apart in Decorah before. Given the dates, it is possible that we've seen the hatch of eggs number two and three instead of eggs number one and two as we initially assumed. Roughly 3% to 12% of bald eagle eggs fail to hatch based on the studies I read, although some sources put the number a little higher, at 10% to 25%. So why wouldn't the egg hatch? Eggs fail to hatch because they are either infertile or nonviable. Infertile eggs occur when the ovum is not fertilized before it begins its journey down the female's oviduct. We know that bald eagles copulate frequently before and during egg laying, which helps assure that sperm is present in the right place (the infundibulum) at the right time (when the ovum arrives). Since female birds don't have a way to reject or stop the egg-laying process once it begins, incomplete, poorly timed, or insufficient copulation can result in unfertilized eggs. Insufficient incubation. Incubation is fairly complex! Eggs must be kept at the proper temperature and humidity and turned regularly. Freshly laid eggs can spend time in the zone of suspended development (roughly 28.4 to 80.6°F) with no harm to the egg or embryo, but eggs must remain between about 99 and 104°F once development starts. Time off the eggs regulates humidity and helps keep pores from clogging. Turning or rolling the eggs prevents the developing embryo from sticking to the side of the egg, brings it into contact with fresh 'food' and important nutrients supplied by the yolk and white, and assures proper development of the membranes that exchange gas and protect the embryo from contaminants. Piercing or cracking of the shell. If the egg shell is pierced or cracked before the embryo is fully developed, it will die. This can happen if the egg is jostled too vigorously, stepped on, or damaged or destroyed by an intruder - something that has been documented in many species of birds. Insufficient nutrition. Given all that we've seen the eagles eat, this doesn't seem to be especially likely in Decorah. But if a female bird is insufficiently nourished before she begins laying eggs, her eggs won't have the nutrients needed to nourish the developing embryo. Bacterial or chemical contamination. Although the embryo is protected by a shell and layers of membrane, contaminants can sometimes make their way into an egg and impede or kill the embryo inside it. We aren't going to attempt to retrieve the egg if it doesn't hatch - at least not while the birds are in the nest. Without opening the egg, we have no way of knowing why it failed. On one hand, the eagles spent a surprising amount of time off the first two eggs. On the other, studies in some species of birds indicate that infertility is more common than non-viability. Infertility is also more likely to prevail in first and last-laid eggs, which is unsurprising given the importance that timing plays in fertilization. What will happen to the egg? 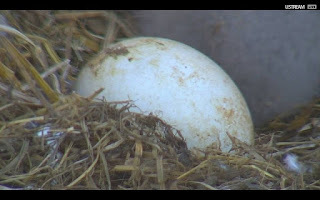 Different species do different things, but bald eagle eggs are commonly buried under layers in the nest, where they presumably break and decompose. Eggs may also be pierced or trampled as siblings grow and become more active. We will look for the egg if we go into the nest this fall. If we find it intact, we will turn it over to the USFWS for study. Will the next eaglet to hatch be called D26 or D27? This is confusing to followers who have seen nothing but production success. However, peregrine falcons aren't always successful and we don't count production until after banding. A falcon that makes it to fledge but dies soon after is still considered in production counts, but a falcon that dies before banding is not. If this egg doesn't hatch, the next living eaglet will be called D26. It's hard to believe that we could have an unhatched egg after so many years of success. How many times have we been worried about something only to have it all turn out right? But eggs don't always hatch and even excellent parents like our Mom and Dad experience failure. I'm glad we have D24 and D25 to watch this year and I look forward to studying the dynamics and rearing of two siblings, even though I wish there were three. If we have a chance, we'll retrieve the egg for inspection and we will also review the video record to determine how much time was spent off the first egg. Note: While I included contaminants on the list of things that can cause eggs to fail, my guess would be that this egg failed due to infertility (statistically more likely according to what I could find) or incubatory failure due to cold exposure.